Three hundred and fifty five soldiers and serving officers of the Indian Army have approached the Supreme Court alleging dilution of the Armed Forces (Special Powers) Act (AFSPA) without specific amendment to that effect. The petition was mentioned before a bench comprising Chief Justice of India Dipak Misra and Justice AM Khanwilkar today by Advocate Aishwarya Bhati, representing the petitioners. The Court has agreed to hear the case on 20 August. Allegations of there having been 1582 cases of extra-judicial killings in Manipur between the years 2000 and 2012 were levelled by several petitions before the Supreme Court, leading to constitution of a Special Investigation Team (SIT) of the CBI in July, 2017. The petitioners have now alleged that the investigation against the armed forces personnel has been carried out in a “hasty manner”, without following the prescribed procedure of CBI manual. They further assert that the ongoing enquiry is being “forced” to be sped up by the court, by directing them to file charge-sheets in a time-bound manner. The petitioners contend that the procedure adopted so far has created a hostile environment on ground, leading to demoralisation of officers. The officers, they say, are in a “confused state of mind”, torn between not following orders and getting tried by Court Martial on one hand, or being prosecuted by the criminal justice system for doing their duty, on the other hand. They further point out that the impugned acts were committed by the officers on orders from their superiors, who in turn received orders from the Government of India. Therefore, asserting that the officers were discharging bona fide official duty, the petitioners submit that the accused officers should be given absolute immunity for the acts done for the purpose. A. Whether the rights of soldiers have been violated vide an order passed in Writ Petition No 129/2012 without giving fair chance to the personnel involved in the operations to represent on the orders to institute prosecution against them when Govt. of India has justified their stand and vicarious liability? B. Whether the officers who lead their men in extremely difficult environment and trying circumstances be given clear directions and so as to enable them rather than chastise them at a later stage while operating in such areas. Superseding or editing the army manuals and précis be done with respect to the initiative taking qualities and tactics that have been carefully thought of and carved to guide them in their selfless aim to curb the militancy or terrorism for protecting the sole interests of the country? C. Whether the Indian Army which has never failed their country having past glorious history of sacrifices and martyrdom find themselves standing alone and helpless with their men in the areas under AFSPA in a confused state of mind that if they don’t follow the orders they will be tried by Court Martial and if they do they will be prosecuted by criminal judicial system and legal harassment to their families who also make sacrifices and live in separation? D. Whether this is not the question of national security when the soldiers are put into such legal harassments which would lead to their eventual loss of morale or motivation for endeavours that were aimed for protection and selfless service to the motherland based upon an act passed by the parliament of India which assures adequate legal and physical safeguards? E. Whether the action in good faith of an officer and Non commissioned officer while discharging their duties granted by the law under section 4 of AFSPA is absolute and grants protection from prosecution or subject to legal scrutiny even when those actions were established through enquiries to be done in discharge of their duties? F. Whether it was correct to believe that military operations are comparable with the police operations or urban mafia without even going into the details of circumstances under which these operations are conducted which are very difficult with respect to the jungle and hilly terrain on a daily basis with no guarantee of returning alive or together in one shape and also to the fact that the Hegde commission has no such member with an experience of such operations in such a tactically challenging environment? G. Whether it was correct by the court to conclude and call the soldiers 'murderers' even when the investigations were not concluded during updates presented by Director CBI indirectly suggesting an ab initio prejudice against the soldiers? H. Whether such an act will not amount to creating indirect influence in the mind of investigating agencies to act fairly during investigations of these old cases? I. Whether serving personnel of the Armed Forces of India operating in the State of Manipur and J&K can be held individually for acts done in good faith in pursuance to orders passed by the Central Government? J. Whether serving personnel of the Armed Forces of India operating in the State of Manipur and J&K warrant no protection from the legal harassment committed against them by the people backing these anti national elements? K. Whether serving personnel of the Armed Forces of India operating in the State of Manipur and J&K are perceived as enemies of State agencies and therefore dispensable pawns and not given any protection? L. Whether serving personnel of the Armed Forces of India operating in the State of Manipur and J&K do not deserve the same dignity and respect commanded by other belted officials of both Central and State agencies operating in the other parts of India? M. Whether the terms of engagement followed by serving personnel of the Armed Forces of India operating in the State of Manipur and J&K in dealing with unlawful assemblies and other terrorist organizations towards the protection and reverence of the sovereignty and integrity of India is not perceived to be justified by law and therefore individual personnel will find their names individually figuring in First Information Reports? N. Whether the life, limb and property of serving personnel of the Armed Forces of India operating in the State of Manipur and J&K are of no value to the State agencies? O. Whether the Arbitrary exercise of executive power in the State of Manipur and J&K against serving personnel of the Armed Forces of India operating therein warrants no separate investigation? P. Whether this is not the question of national security when these serving army officers who has acted in good faith to establish the writ of government in their past are being put into such legal harassments to demoralise our officers and men? Q. Whether the rights of a soldiers has not been violated vide an order passed in a writ petition no 129/2012 without giving fair chance to the personal involved in the operations to represent on the orders to institute prosecution against them when Govt of India has justified their stand and vicarious liability? R. Whether the officers who lead their men in such circumstances should not be crystal clear as to whether or not they should take risk while operating in such areas and pass clear order with respect to the initiative taken by them in advance to curb the militancy and any untoward incident at later stage or compromise with the safety and security of country? S. Whether the discretion of an officer and Non commissioned officer while discharging their duties as granted by the law under section 4 of AFSPA is absolute and grants protection for prosecution of those actions and are treated to be absolute or subject to legal scrutiny even when those actions were established as to be in performance of discharge of their duties by the competent authorities? Laying down of specific guidelines to “protect the bonafide action of soldiers under AFSPA, so that no soldier is harassed by initiation of criminal proceedings for actions done in good faith in exercise of their duties”. Declaration that the provisions of AFSPA cannot be diluted without a specific amendment in law. 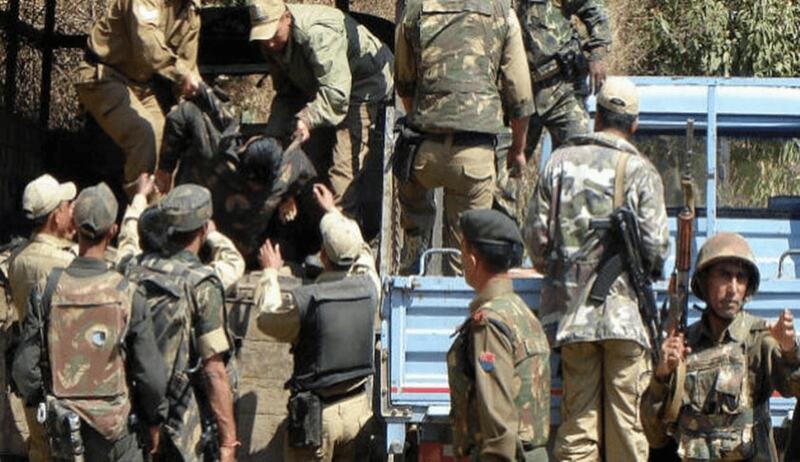 Direction that no prosecution, suit or other legal proceeding be instituted against officers acting under the AFSPA without prior sanction from the Central Government. Declaration that any investigation into the criminality of actions of soldiers operating in AFSPA areas, without taking into consideration the Standard Operating Procedures of Indian Army, and, without the aid and advise of those who understand full dynamics of such military operations, is illegal, unconstitutional and non-est. Initiation of investigation against individuals or organisations targeting soldiers by filing complaints against them. “arbitrary exercises of executive power” impairing the functioning of the Army in the areas covered under AFSPA. Award of adequate compensation to the effected serving personnel and their families, “who have been unnecessarily embroiled in malafide criminal proceedings in discharge of their bonafide duties”.